Aliases: Broker, the Mogul, "Walker Declun"
Powers/Abilities: Cold and calculating, Declun possesses great wealth and business savvy. Declun has robotic eye implants, and briefly developed super-strength and durability after taking the Mutant Growth Hormone. (Wolverine III#45 (fb)) - Namor, the Sub-Mariner, encountered Walter Declun while running Oracle Inc.
(World War Hulk Aftersmash: Damage Control#1 (fb) - BTS) - Declun pushed Robin Chapel out of her position as CEO. (World War Hulk Aftersmash: Damage Control#3 (fb) - BTS) - Damage Control Account Executive John Porter believed Declun "cheated" Chapel out of her job. (Wolverine III#46/Civil War#1 (fb) - BTS) - Declun planned to foment super-human violence and profit from subsequent reconstruction, leading him to provide Nitro with the Mutant Growth Hormone pills that gave him the power to ravage Stamford, Connecticut. (Wolverine III#43 - BTS) - Declun provided the fugitive Nitro with a secluded cabin to go into hiding. (Wolverine III#43) - Nitro contacted Declun after slaughtering Wolverine and a platoon of S.H.I.E.L.D agents that ambushed him at his cabin. Learning that Nitro tried to take out an Avenger and an X-Man, Declun decided to sever ties with Nitro. (Wolverine III#44) - Declun discussed the ongoing Nitro situation with with Henry Ackerdson, assuring his nervous associate that Nitro was cut loose and his actions wouldn't be traced back to them. (Wolverine III#46) - Wolverine arrived at Damage Control, Inc. to question Declun, who promptly called S.H.I.E.L.D to arrest Wolverine for trespassing. Wolverine proceeded to coerce Damage Control investors into selling their stock. Learning of Wolverine's actions while discussing possible changes to the Damage Control logo with Henry and seeking to combat the negative press surrounding Damage Control's falling stock, Declun announced the purchase of Roxxon's Long Island, New York office building. 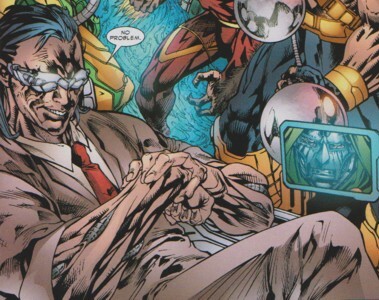 (Wolverine III#47) - The Damage Control board of directors held a meeting to discuss ousting Declun, who argued in his defense, citing the recovery from possible bankruptcy and rising profits during his tenure. As Wolverine arrived and the board fled, Declun, to even the odds, took several Mutant Growth Hormone pills. Lunging at Wolverine, the two plunged through a top-story window, crashing onto the streets. Out-matched, Declun suffered as Wolverine beat him senseless, before he thrust his claws through Declun's eyes. (Amazing Spider-Man II#1 (35) (fb) - BTS) - Declun miraculously survived his encounter with Wolverine, but required extensive reconstructive surgery and cybernetic eye implants. Using his influence with media outlets, Declun saw to it that his encounter with Wolverine was not covered by the mainstream press, although rumors of it began to spread from on eyewitness accounts. (World War Hulk Aftersmash: Damage Control#1 (fb) - BTS) - Robin Chapel overhead the rumor that Wolverine killed Declun. (Amazing Spider-Man Annual II#1 - BTS) - Jackpot went after corrupt businessman Walter Declun, who she began accumulating information on. (Amazing Spider-Man II#1 (35) (fb) - BTS) - Following his recovery, Declun sued the few media outlets to report on his encounter with Wolverine for defamation. While dealing with the ongoing suits, Declun formed Declun International, putting his 100 million dollar severance package from Damage Control to use. Declun began to form a media empire, buying up three media companies, a newspaper, and applying to purchase a radio station, while expanding into other areas, including real estate and biotech. Declun's biotech company developed Oedipus, a neurotoxin capable of inducing temporary blindness. The scientist who created Oedipus, Nick Chernin, later became the prime suspect when Oedipus was stolen, but the charges were mysterious dropped. (Amazing Spider-Man II#1 (35)) - Declun agreed to an interview with DB reporter Betty Brant and photographer Peter Parker. Answering questions regarding his seeming death, Declun claimed he was attacked unprovoked by Wolverine and following a period of recovery and his departure from Damage Control, he opted to expand his empire. Asked about his interest in biochemistry, Declun admitted to have purchased a company in that field, but chose not to explain further, believing Brant and Parker would be unable to fully understand high finance. (Amazing Spider-Man II#590 - BTS) - Declun made a bid for Mayor of New York during an emergency run-off election after general election nominees Randall Crowne and Bill Hollister stepped down. (Amazing Spider-Man II#591 - BTS) - Declun and follow candidate Martin Li, the front-runners in the election, tried to stop third-party candidates from entering their debate after a number of "joke candidates" began to pop up. 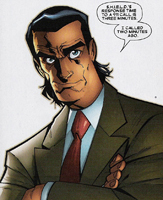 (Amazing Spider-Man II#591) - During a debate with Li, Front Line reporter Sally Floyd asked Declun why the debates weren't being opened to third party candidates. Declun joked that he thought Li was the third party candidate due to his lack of experience. When that failed to evoke a reaction he checked to make sure his microphone was on. The election was ultimately won by third party candidate J. Jonah Jameson. (Black Panther V#8 - BTS) - Declun made a fortune as the Broker, selling stolen technology to terrorist groups via Hellerman Exports, a company in Newark, New Jersey. (Black Panther V#9 - BTS) - Broker made a deal with two former Wakandan soldiers, who served the Desturi, to get his hands on Wakandan targeting microchips. (Black Panther V#10 - BTS) - At some point Broker began to work for Doctor Doom. (Black Panther V#7-10 - BTS) - Broker did everything from tinkering with video files with all the technology available to him to placing false information on clients in his own files to frame Namor for Doctor Doom's attack on T'Challa. (Black Panther V#7 - BTS) - Broker sent his Cybernauts to take out Black Panther (Shuri) after she visited the White House, but they failed. (Black Panther V#8 - BTS) - After doing some research for Shuri after the attack on her N'Iix found a connection between the weapons used in the attack and the enigmatic Broker's Hellerman Exports in Newark, New Jersey. Black Panther (Shuri) broke into HEX to steal their data and was attacked by the mercenary Ohyaku. The Desturi watched the fight through cameras, knowing very well that even if she escaped with the hard drive it would not lead her to them, but Namor, whom they hoped would destroy her. (Black Panther V#9 - BTS) - Shuri escaped HEX with the hard drive. N'Iix looked through the hard drive and found detailed records on his clients including surveillance. According to the files one of Broker's clients was an Atlantean going by the codename Rex, who was selling Atlantean technology to him. They also found information on two Wakandans traitors working for Broker. Shuri went after one of the soldiers, D'Arun, who blew himself up before she could force him to reveal any information on his masters. Shuri survived the explosion, but was then attacked by Broker's Cybernauts and Ohyaku. (Black Panther V#10 - BTS) - Shuri escaped Broker's mercenaries. (Black Panther V#10) - Doom told Broker they were ready for the next phase to make Wakanda burn. Broker was impressed how Doom had taken Storm and T'Challa out of the game because now only Black Panther (Shuri) was left, but Doom assured him she was taken care of already. (Black Panther V#11) - Broker was still following the news in Wakanda when Doom contacted him again to tell him Shuri had been taken care of by Namor. It was time for the Desturi to take over and set Wakanda ablaze. After Mr. Fantastic found out that the video files of the attack on T'Challa had been tinkered with to frame Namor, he was sure the Broker had to be behind it. He then used his technology to track the carrier signal the Broker was using. Doom warned Broker that Black Panther (Shuri) and her friends would soon put together the clues and be coming for him. Declun and his hired mercenaries (Absorbing Man, Hydro-Man, Killer Shrike, Lady Octopus, a Mandroid, Porcupine, Rock and more Cybernauts) were ready for them. (Black Panther V#12) - Black Panther (Shuri), the Fantastic Four and Namor were attacking Broker's island base. Declun watched the battle with Mrs. Tickle at his side. He assured her everything went according to plan and that they would soon be leaving the island. Shuri finally broke through Declun's window and confronted him with Mr. Fantastic and Namor, the latter recognizing him as the man responsible for the disaster in Stamford. Declun complimented them on finally reaching him and was happy he was remembered for his past work. Before teleporting away Declun mocked Shuri because he was just the middleman and Shuri didn't even notice what was going on back in Wakanda, which had been overthrown by the Desturi while she went after the Broker. (Doomwar#1) - Declun and his personal assistant Mrs. Tingle were waiting for the next step of the plan in a hidden base on the Easter Island with an army of enhanced Doombots. Declun told Tingle they would only stay there for a couple of days until Doom had secured all of Wakanda's processed Vibranium. Tingle was growing impatient because after all the planning she wanted to see the world burn. (Doomwar#3) - After Doom had successfully stolen Wakanda's Vibranium Declun commented on it as nothing more than a big slab on metal. He assured Doom T'Challa would attack Doom with his army to retrieve it and they were not yet ready to face Wakanda's army. Doom asked Declun to buy them more time. Declun needed staff, equipment, raw materials and bribes, but Doom didn't care how much it would cost as long as Declun succeeded. Declun and Tingle awaited the arrival of six Wakandan Quinjets on Easter Island. They came sooner than Doom expected, but Declun was ready for them and told Tingle to release the hounds (large, flying, robotic panthers) upon them. (Doomwar#4) - In Area 113, Doom's private lab, Declun complimented Doom's new generation of Doombots battling Shuri and the Dora Milaje while the hounds took down the Quinjets and fought the Fantastic Four and Storm on Easter Island. Declun later informed Doom that sixteen attack aircrafts had launched from Wakanda ahead of schedule. Doom was sure this was a move by Shuri and not T'Challa. Declun and Doom witnessed Shuri, the Dora Milaje, Storm and the Fantastic Four taking down their Doombot factories all over the world. Declun warned Doom of losing this war by losing his infrastructure that had allowed him to wage so many wars over the years, but Doom assured Declun he was still winning. (Doomwar#5) - Declun reminded Doom he was not only there to run Doom's global network, but was also to remind Doom not to underestimate his enemies. Doom assured Declun he was not underestimating T'Challa and Mr. Fantastic. Declun pointed out the collateral damage to Doom's physical network, but Doom knew it nothing of it mattered because he would be victorious tomorrow. Tingle informed Declun after they had been hacked. Declun was shocked when he saw that their enemies had not just rerouted over a hundred billion Euros of Doom's money, but had given them to charities. Declun was sure Doom would kill him for this failure. (Doomwar#6) - Declun informed Doom all his bank accounts had been wiped out by Shuri and her team, but it didn't matter to Doom because his machine to link him to every Vibranium fragment of Earth was finished. Over a screen Declun watched in awe as Doom activated the machine and took control over any Vibranium fragment on Earth. When Shuri called Doom out to fight her, Declun warned him that it was a trap, but Doom didn't care and just wanted to end it. During his final confrontation T'Challa destroyed all processed Wakandan Vibranium on Earth to defeat Doom. 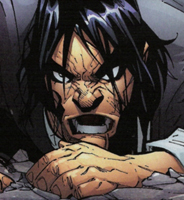 (Heroic Age: Villains#1) - Steve Rogers, director of S.H.I.E.L.D., did some research on Declun and suggested to purge him of his MGH-derived powers before incarceration and keep him under special protection because even in prison many would want him dead for his involvement in the Stamford explosion. Declun's friendship with the "sitting President" was noted by Maria Hill in Wolverine III#47. 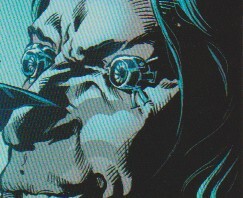 Declun became involved with Damage Control "three years ago", according to Wolverine III#46. If that's the case, it's possible he was behind the scenes for many of their recent appearances. It may not be Marvel time...a lot of writers just don't get that, so he may have meant 2004 and stories published in that year. Here's Declun's description in the Amazing Spider-Man Annual#1(35) role call: "And introducing the most dangerous Marvel villain since the Kingpin... THE MOGUL! (Actually it's a guy named Walter Declun, but legal needed something to trademark! He's a nasty piece of work, though!)" It probably should've been "RE-introducing..." but who am I to quibble? Profile by G Morrow. Black Panther & Doomwar update by Markus Raymond. Any other Walters or Decluns.